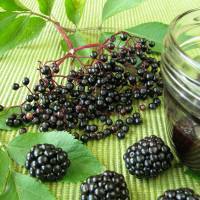 Blackberry & Elderberry Wine Recipe - Home Brewing, Wines & Beers etc. This simple and easy blackberry & elderberry recipe is another of those traditional hedgerow wines made in the countryside for many years. It’s similar to a Burgundy wine, well bodied with a strong multi-flavoured nose. The bananas are a more modern addition adding a subtle overtone. Strip the elderberries from the stalks and wash well. Strip and rinse the blackberries.If you immerse the fruit in a bowl of cold water for a few minutes, any hidden insects and grubs will float out. Put into a fermenting bin and crush.A traditional potato-masher is prefect for the job. Pour on 4 pints of water. Add 1 Campden tablet, crushed and dissolved in a little warm water. Peel and mash the bananas and add to the pulp. Add the yeast and nutrient and cover and allow to ferment for a week, stirring daily. Boil the rest of the sugar in 1 pint of water for 2 or 3 minutes and, when cool, add to the rest. Rack, as necessary, adding 1 Campden tablet after the first racking to stop fermentation. This Blackberry & Elderberry wine recipe will produce about a gallon of Burgundy style wine. Do give it at least a year to mature although two would be better. Is the bung in firmly? Sounds like a mechanical problem. I’ve got five gallons on the go and I can see bubbles coming up from the mix but it doesn’t move the air lock. I am not worried so long as no bugs can get in it. No need to worry there’s probably not enough pressure to move the air lock. They seem to work better on demijohn containers.